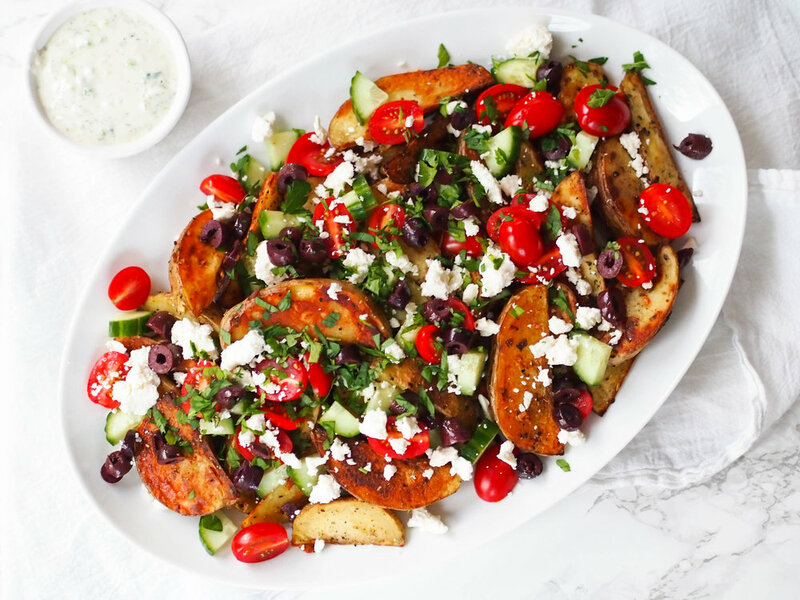 Loaded Greek fries are the perfect appetizer for entertaining! Serve with garlic-scallion sauce, or top with chickpeas or chicken to make it a meal! A couple months ago, we almost had a break in at our house. My husband had just left for work and I was taking a shower when I heard the dogs barking like crazy. They do that when someone walks by our house, but when they kept barking, I got concerned. I walked to our front door to check out what was going on when I noticed someone leaving our front porch. I quietly peered through the blinds and noticed this creepy KKK looking guy sitting in our front yard with a case of beer under his arm, peering into our windows. Needless to say, I was terrified. So, I did what anyone should do in such a situation. I ran into the bedroom, got under the covers, and hid. Yes, just like a child. After a few minutes, I managed to drag myself out of bed, cross my fingers and see if he went away. Nope. Less cute Ed Norton from American History X was still there, looking like he was trying to get in to the gate to our backyard. Finally, I called for help. Except instead of calling the cops really anyone useful, I posted on my neighborhood facebook page asking if I should call 911 or our neighborhood cop, and texted my husband, both of which promptly responded "CALL 911 YOU IDIOT!" Moral of the story? Big dogs and a male neighbors who pull up at just the right moment are good things to have. Also, my fight or flight response is more like curl into the fetal position and freeze. I've learned my not very useful fear reaction is the same for real threats (creepy dude trying to break in, speeding car coming at me while crossing the road) and perceived threats (fear of failure, fear of global catastrophe, fear of rejection). Both metaphorically and physically, I'm scared into inaction. This year, I've spend a lot of time feeling scared, fearful of things that actually seem quite likely. Part of it is the general chaos of the world. Another part is feeling like I'm on the verge of Really Big Things happening for my business, which sounds great, but with big possibilities there's also big chances for failure and all the pain that comes along with that. Both are pretty certain - bad things will happen in the world (because bad things always happen - how much and whether it affects me personally is unknown), and I will fail with at least something in my business. I don't spend my days curled up in a ball on my office floor, but I have been spending a lot of my days lost in my mind, kinda the metaphorical version of being frozen into the fetal position. Because in a sense, that's really all that mindlessness is - your brain's attempt to protect itself from a scary reality. But the more time I spend mindlessly checking social media or lost in thought, the less time I have for action, the one thing that can actually cure fears. "Being responsible to my commitments and the people who have given me so much while also giving everything I have to what I really feel I should be doing… that’s the only way I know how to deal with what’s going on in the world. To continue to feel things fully. To start giving back to the people and organizations in my community. To hold others accountable to live into their best selves. To be fully and totally aware and appreciative of the freedoms and “ordinary” luxuries I enjoy every day." Her words hit me hard. Responsibility sounds so....boring. As someone who has lived a life of privilege (as most of you sitting here reading this have), I've also lived a life free of any major responsibility. Yes, I was responsible for chores and responsible at my job and I'm responsible for taking care of my fur babies, but the only person who would have really suffered if I shirked my responsibilities was me (and, you know, the pups). Now I feel a sense of responsibility to the world. I have a responsibility to those with less privilege to not exhaust myself with anger but to harness that energy to speak out and take action. I have a responsibility to take those scary next steps with my business, for both my clients, and you lovely readers, because as uncomfortable as it feels to type this, I know from your emails and comments that this blog has been an inspiration for many recovering from disordered eating. I also have the responsibility to practice self care and take care of my needs, because as Celia said, "the world needs your light and laughter and joy. It needs it real bad, y’all"
Thinking outside of myself and my personal fears, I know many of you reading are at varying places in your journey to making peace with food, struggling with low body image, food fears, disordered eating and/or a desire to go on yet another diet. Maybe you're stuck in a scary place right now, where you can see the light at the end of the tunnel, but the tunnel is dark and scary and cold. You have a responsibility to not turn around, because whether you recognize it or not, there's people who rely on your existence and you have the responsibility to give them your best self. Whatever that next scary next step is, I encourage you to swallow your fears and take it. Need some support - feel free to leave a comment! To turn this into dinner, top with slices of cooked chicken, gyro meat or chickpeas! Preheat oven to 425 degrees. Toss potatoes with olive oil, garlic and oregano in a large bowl. Season with salt and black pepper. Spread potatoes evenly on 2 large baking sheets and roast for 35 minutes, flipping halfway, until golden and tender. While potatoes are baking, mix all garlic-scallion sauce ingredients together. Season with salt to taste. Set aside until ready to use. When potatoes are cooked, transfer to large serving dish. Top with tomatoes, cucumber, feta, olives and parsley. Serve with garlic-scallion sauce.